There are about 90 species of Elaeagnus around the world. The majority are native to the temperate and subtropical regions in Asia, of which nine species can be found in Taiwan . Many species of Elaeagnus are considered as folk medicinal plants, e.g., E. umbellate , E. pungens , E. angustifolia , and E. multiflora . Triterpenoids, steroids and flavonoids have been isolated from several species of Elaeagnus, e.g., E. ungens , E. umbellate , E. bockii , E. orientalis , and E. pungens [9, 10]. 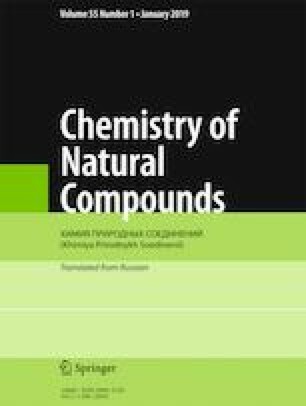 In the course of screening for biologically and chemically novel agents from Formosan eleagnaceous plants, E. grandifolia Hayata was chosen for further phytochemical investigation. This is also being studied and published for the first time. Published in Khimiya Prirodnykh Soedinenii, No. 2, March–April, 2019, pp. 285–286. This investigation was supported by a grant from the Yuan′s General Hospital awarded to C. L. Lin.